There are two ways of serving lamb cutlets, either roasted whole on the rack then sliced up, like we have here, or sliced up then seared on a very hot griddle pan. Either way, the meat wants to be cooked on a high heat to become nice and crisp on the outside yet tender and rare in the middle. For us, nothing is a greater treat than a lamb cutlet, a delicious and joyous mouthful that is over far too quickly. There are many wonderful ways you could marinade them, taking them to the Far East, India or Asia but at the end of the day our favourite way is to marinade them simply with garlic and garden herbs. Just writing this makes your mouth water in excitement for the possible deliciousness. This is a dish that is simple and quick to put together but has great impact. The meat speaks for itself and the sauce is punchy and moreish. Both brilliant for the BBQ. For the lamb you would want to get the coals hot and let it cook fast, the trick is then in the resting where the flavours really come together. The green sauce will not only go with the lamb but pretty much anything else you decide to serve with the BBQ whether it be beef, chicken or veggies – particularly good with potato or sweet potato wedges. It also works well with crudité. Cooking lamb in its whole rack looks really impressive, it is the ‘yes I have made an effort’ look but with very little effort, couldn’t be more satisfying. If looking for something to serve alongside potato dauphinoise would be very good and a crunchy green like an al dente French bean in olive oil, salt and lemon. Or some peppery greens like rocket and mustard leaves would work well. 1. Mix all the marinade ingredients together and rub over lamb. Cover and marinade for 20 minutes or longer. 2. Make the salsa. Whiz all the ingredients together in the food processor 3. Heat the oven to 250c. take the lamb out the fridge and bring to room temperature. Place the racks in an oven proof tray and place in the oven. 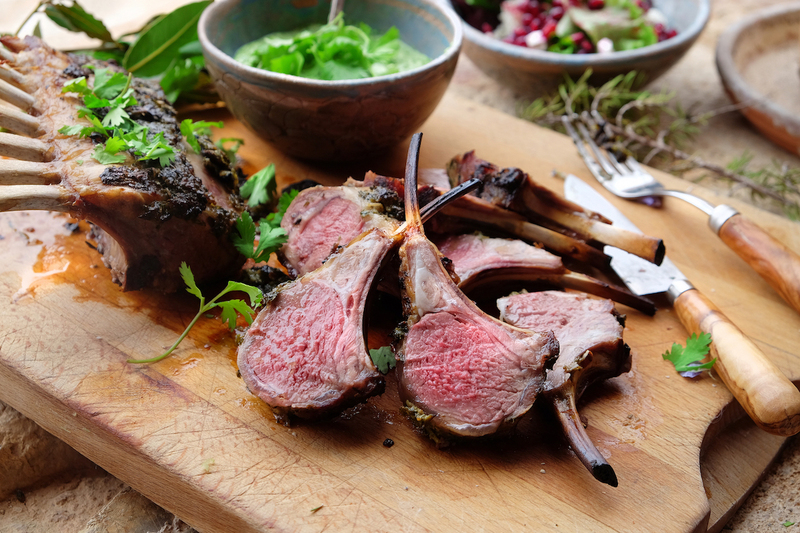 Cook the lamb for 20 – 25 minutes, depending on the size of the loin. Take out and rest for a good 20 minutes. 4. Slice up and serve with the salsa.